Have you seen PDM’s first editorial shoot? Yes? Let me know what you think! If not, don’t miss out the fun and see it all here. 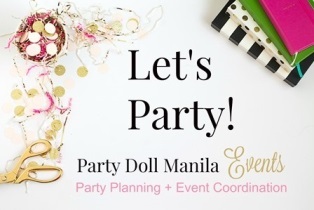 Party Doll Manila turns 3 this year and I wanted to do something different. Ever since I started PDM, one of my dreams was to have an actual editorial photoshoot. I’m so grateful for all the support we’ve been receiving and to be honest, this made us keep going all these years. This time around, as a “Thank you!” to all readers out there, we want to give you something in return. Last July 13, 2016, together with some of my favorite party suppliers, we have come together and shoot this editorial for you. It all started with an idea but let’s face it, without these super talented suppliers who are willing to share their time, effort and talents with me, this shoot will not be possible. From the bottom of my heart, you guys rock! Thank you soooo much for making my dream a reality. If I were to throw a party right now, these are my dream suppliers. I’ve seen their works and I’m most certainly impressed that’s why I hand-picked each and every one of them to join me in this special project. So…here are some of the BEHIND THE SCENES photos from the shoot and get to know the amazing people behind their brands/businesses. Photo credit to Stanley Ong Photography and Jennie of Pinwheel Crafts. Dianne Khu Designs. She’s the creative mind of the team. She translated all my ideas perfectly and also contributed a lot during the design process. Stanley Ong of Stanley Ong Photography. Sweets Creations by Mums owned by Jo-ann Tuazon. 8 Spoons Catering headed by Michelle. Reserv (Chairs) owned by Benedict and Kenny Del Rosario. Again, to all the suppliers, a huge huge thank you!! PS: Special shout out to Ms. Jen, Mr. JM and the wonderful staff of Sampaguita Gardens.